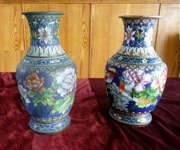 We had a visit to a cloisonné factory. 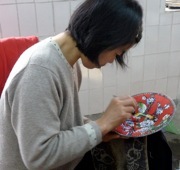 Cloisonné is an ancient craft, where artisans create brilliantly colored pieces with often complex patterns, using strips of metal and traditional painting techniques. Strips of metal are glued onto the piece. Then glazes are put into the metal “pockets” with eyedroppers. The piece is then fired, and later burnished. Cloisonné, also known as cloisonné enamel, is the decorative art of applying enamel of all colors to the surface of a copper or bronze object which is then fired to become a bright and colorful work of art. This artistic technique was transmitted to China from the West and reached its peak of perfection as a result of the concerted efforts of Chinese artisans. Chinese cloisonné thereupon became the standard by which to measure the quality and appraise the beauty of cloisonné worldwide. This ranks as one of China's major contributions to the world's fine arts. The technique of cloisonné enameling was passed onto China by missionaries from central Asia sometime in the early to mid-14th century. After mastering the skill of manufacturing enamel products, Chinese constantly improved and enhanced this special technique, making it a distinctly Chinese art. During the mid-15th century reign of Ming Emperor Ching T'ai, cloisonné production was extremely prosperous--many cloisonné works of the most delicate quality were produced. These works were mostly fused with a kind of special blue enamel as the base color, hence the term for cloisonné in Chinese: ching-t'ai-lan ("Ching-t'ai Blue"). The main reason that such stunning achievements were possible in so short a time after cloisonné technique had been transmitted to China was that the Chinese nation of the time possessed excellent conditions for developing cloisonné enameling art--it already had metallurgical technology, such as bronze casting; glass and glaze production techniques were well-known; and how to accurately control the firing temperature was already understood. Another reason was that the enamel was as soft and smooth as jade, as glittering as jewelry, and as delicate as china--satisfying many sorts of Chinese likings. The general method for making cloisonné involved first soldering brass wires to the surface of a copper object to form a pattern or illustration, then, according to the requirements of each pattern, colored enamels were filled in. Enamel was made by melting different materials such as red lead, boric acid borate, and glass powder together to become an opaque or translucent glistening substance. A variety of oxidized metals are added, and the substance then changed into enamels of different colors, or enamel coloring. After the melted enamel cooled and became solid, it was then ground into powder and mixed with water prior to the filling in process. After the spaces delineated by brass wires on the copper object were filled in with enamel paste, the object was then fired. After every firing, the enamel would contract, producing an uneven surface. It was then necessary to fill in the uneven places with enamel paste of the same color many times over. This procedure had to be repeated many times until every filled-in space became thoroughly smooth without any depressions. Only then was the firing process complete. Enamelware that had been fired then needed to have its surface polished smooth so that the soldered brass wire pattern and the enamel substance were melded into one. Finally, the exposed brass wires between parts of the patterns as well as the rim and the bottom of an object, to which enamel had not been applied, were gold plated. Thus, a work of cloisonné art was finished. An exquisite piece of cloisonné must have colors that are moist and glossy, fresh and bright, a body that is substantive and sturdy, a wire inlay that is neat and well-proportioned, and gold plating that glitters. Its delicate appearance and splendid patterns should emit a classical warmth that rivets the gaze, and leaves one too infatuated to part with it. burnishing the finished cloisonne They had all of us try our hands at laying the glazes onto the bowls, and selected Arthur's design as the one they liked best - for which he received a pair of cloissonné chopsticks. Arthur Luehrmann admires a finished vase Some of us went to the bathroom in the cloisonné factory, and were presented with a traditional Chinese toilet, where you squat on the floor, bring your own toilet paper, and discard used toilet paper in a trashcan. It is surprisingly easy to use. 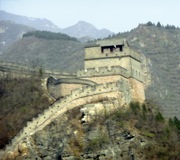 We then rode through the suburbs of Beijing to the Badaling Hills, arriving at the fabled Great Wall of China. Construction of the Great Wall began during the Warring States Period (403-221 BC) with sections built in scattered areas. It was only following China's unification under the first emperor Qin Shi Huangdi (221-206 BC) that some 300,000 men were put to work connecting the segments into one rampart of brick, stone, and earth nearly 4,000 miles long. Intended to shield the nation from foreign invaders, the Great Wall is now, ironically, one of China's leading tourist attractions. Originally built in sections to protect various provinces from northern tribes, the wall's construction ranges from brick and mortar to earthen ramparts. In the 1950s restoration was begun on several significant portions of the wall, including one of the most impressive, at the Badaling Hills outside of Beijing, where construction started in 1345. As you walk along its ramparts, undulating up and down steep hills and graced with massive lookout towers, you can imagine the scenes of battle, ceremony, commerce, and labor that have taken place along its serpentine path to the sea. The great stone towers, that each could garrison hundreds of soldier, are built at a distance of two bowshots apart, so the entire wall could be defended by the archers within the towers. Chinese mythology maintains that demons and evil spirits can only travel in a straight line, and the undulating wall effectively keeps them out. The wall was crowded with tourists, most of them Chinese. The ramps get very steep, and in some places even become steps. We were told that the wall didn't really prove to be that effective at keeping out invaders, frequently because they would have some inside help. I didn't understand why there were crenellations on the inside from which you could shoot while still protected, but none on the outside. Construction of the Great Wall began 2000 years ago during the Qin Dynasty (221-207 BC) when China was unified under Emperor Qin Shihuang. Separate walls, built by independent kingdoms to keep our marauding nomads, were linked up. The effort required hundreds of thousands of workers, many of them political prisoners and ten years of hard labor under General Meng Tian. An estimated 180 million cubic yards of rammed earth was used to form the core of the original wall, and legend has it that among the building materials used was the bodies of dead workers. The wall never really did perform its function as a defense line to keep invaders out. As Genghis Khan supposedly said, "the strength of a wall depends on the courage of those who defend it." Sentries were bribed. However, it did work very well as a kind of elevated highway, transporting men and equipment across mountainous terrain. Its beacon tower system, using smoke signals generated by burning wolves" dung, transmitted news of enemy movements quickly backs to the capital. To the west, in Gansu Province, was Jiayuguan Pass, an important link on the Silk Road, where there was a Customs post of sorts and where unwanted Chinese Were ejected through the gates to face the terrifying wild west. 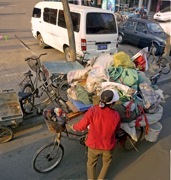 Marco Polo makes no mention of China's greatest public works project. Both sides of the wall were under the same government at the time of his visit, but the Ming Great Wall had not been built. During the Ming Dynasty (1368-1644) a determined effort was made to rehash the whole project, this time facing it with bricks and stone slabs, some 60 million cubic yards of them. This created double walling running in an elliptical shape to the west of Beijing, and did not necessarily follow the older earthen wall. This Ming project took over 100 years, and costs in human effort and resources were phenomenal. The wall was largely forgotten after that, but not it's reached its greatest heights as a tourist attraction. Lengthy sections of it have been swallowed up by the sands, claimed by the mountains, interested by road or rail, or simply returned to dust. Other bits were carted off by local peasants to construct their own four walls. This was a hobby that no one objected to during the Cultural Revolution. The depiction of the wall as an object of great beauty is a bizarre one, since until recent times; it was a symbol of tyranny. 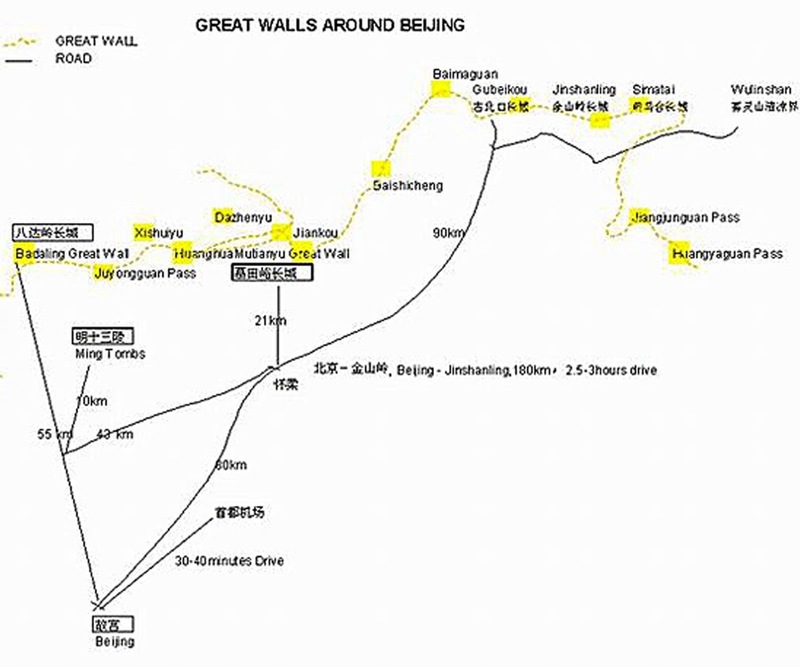 Badaling Great Wall is where we will be going, about 50 miles northwest of Beijing, at an elevation of 1100 feet. It was restored in 1957, with the additional guardrails. The section is almost 20 feet high, with a base of about 20 feet across. It runs for several hundred yards, after which, if you keep going, are the unrestored sections where the crowds thin out. Originally, the wall here could hold five horsemen riding abreast. Now, it is more like about 15 tourists walking abreast. After lunch at a local restaurant, we continued to the peaceful valley that the Ming emperors chose as their burial ground. 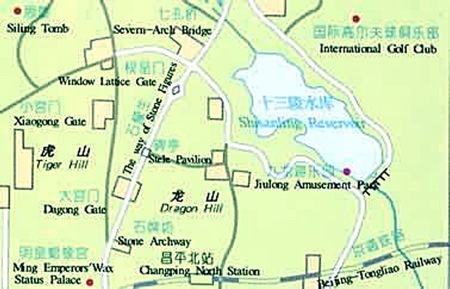 The Ming Tombs are located about 30 miles northwest of Beijing at the foot of the Tianshou Mountains. Located here are the tombs of 13 of the 16 Ming Dynasty emperors. Dragon Hill lies to the east and Crouching Tiger Hill to the west. The first emperor to be buried here was Yongle who died in 1424. His tomb, Chang Ling, and that of Emperor Zhu Yijun, Ding Ling, who died in 1620, are the only two opened to visitors today. 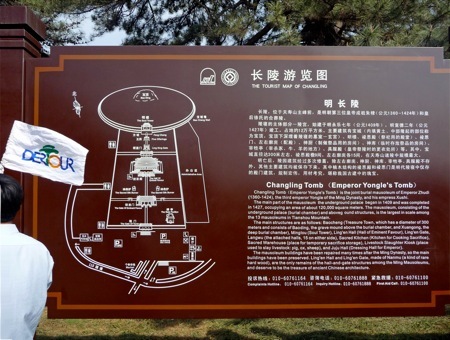 The Ming Tombs are the mausoleums of 13 Ming Dynasty emperors after the Ming capital was shifted to Beijing. They are located at the base of the Tianshou Mountains north of Beijing. A period of 200 years had passed. 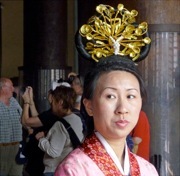 In the various tombs are buried 13 emperors, 23 empresses, one high-ranking concubine and many maids of honor who were buried alive with their masters. 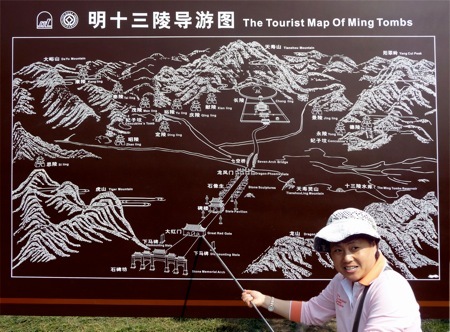 Only Chang Ling Tomb ( which we will visit ), Ding Ling Tomb, Zhao Ling Tomb and the Sacred Road are open to tourists. The Ming Tomb area is covered with trees and also has high mountains and rivers. The area contains everything needed to make it a very special burial place for the 13 emperors with beautiful mountain ranges, fertile soil, rich water sources and thick forests. With the hills behind and the waters in front, each imperial tomb was carefully chosen before its construction. The red walls and yellow tiles in the tombs against the green of the mountains creates a solemn, serene and fresh environment. 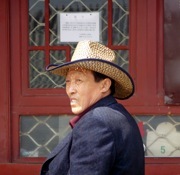 In the middle of the tombs is the Sacred Road, preserving the dignity of the emperors. Along the Sacred Road lie the Stone Carving Arch, the Down-Horse stele, the Red Gate, the Stele Building, Watch Pole, Stone Honor Guard, the Ling Xing Gate and the many stone animal statues and guards. Though different in size, each tomb is made of ground construction and underground construction. Of all the tombs, the Chang Ling Tomb (the tomb of Ming Emperor Chengzu, Zhu Di) is not only the largest but is the best preserved. The Ling En Hall in the Chang Ling Tomb was used to offer sacrifices. The framework of this spacious hall is propped up by 60 pillars which had come from the deep forests in Sichuan, Hunan, Hubei and Guizhou provinces. In ancient times, this was also called the Black Palace" or' Black Bedroom" and the underground construction is where the coffin platform of the emperors and empresses are placed. 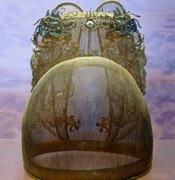 Many artifacts, crowns, silks, jewelry, belts, ancient money and tools are on display in the museum and you will have a chance to view these on your visit of the Ming Tombs. We passed through a great marble gateway more than four centuries old, and went on the Sacred Way, the Avenue of the Animals lined with massive stone statues of kneeling and standing elephants, lions, camels, and fanciful beasts. The Sacred Way runs for about a kilometer and is flanked on both sides by carvings of human and animal figures. There are 12 large stone human figures and 24 of animals, all carved from a single blocks of granite in 1435 during the 10th year of the reign of Emperor Xuan De. Nearby there were tombs housing the remains of 13 emperors and innumerable treasures. The 13 imperial tombs were built from 1409 to 1644, and are spread over nearly 25 square miles. Ming Tombs, entrance to the Sacred Way: Dragon-headed Turtle Tablet pavilion. 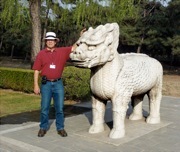 Inside was a large stone carving of a turtle with a dragon head and a tablet containing more than 1,000 Chinese characters.